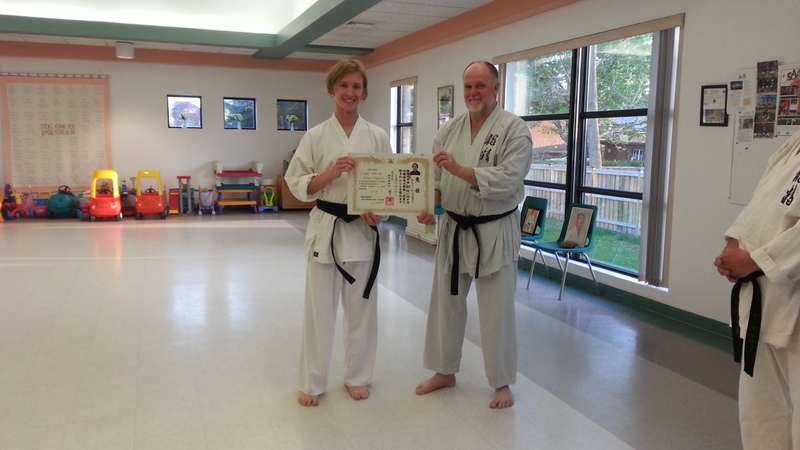 A picture of Barrie Ryusei Karate student Andrew Muszynski receiving his black belt (shodan) certificate. Andrew joined the class at age eight and has put up with nine years of hard work and abuse to achieve this milestone at age 17. Congratulations, Andrew. He and Simon are the only ones from the original kids class to have made it this far. I’ve heard a stat that claims that only one in a 100 will keep with their karate training to achieve black belt. 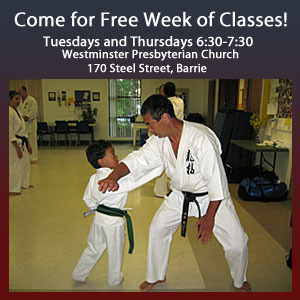 And once you have received your black belt, you are now a true beginner – finally made teachable. Speaking of new beginnings, Andrew is in his last year of high school and next September he will be off to Guelph University to study. If he shows the same dedication at school as he does in karate, he will be covered in academic glory.